The Arctic has long been home to the native Inuit, and a holy grail to adventurers and scientists. In the 21st Century, it is a land of much sought after resources by commercial global industries. Yet in modern times, no place on the planet is experiencing the effects of climate change faster than the Arctic. 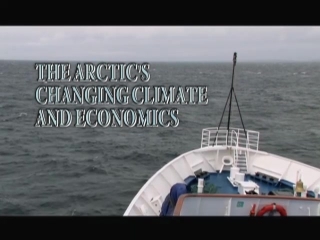 This program, The Arctic's Changing Climate and Economics, explores the dramatic changes brought about by climate change to the Arctic's ecosystems, climate, geopolitics and economics. This astonishing and informative program, The Arctic's Changing Climate and Economics, explores the dramatic changes, brought about by climate change, to the Arctic’s ecosystems, climate, geopolitics and economics. 1.) Chapter 1: What is the Arctic? 00:03:28The Arctic, an area inside a circular line on the globe known as the Arctic Circle, lies in the northern hemisphere and contains the Arctic Ocean. 00:03:50The Arctic is largely defined by its ice cap, sea ice and polar ice. 00:04:20After the Arctic's Northwest Passage was completed by Roald Amundsen and the Northeast Passage was completed by Adolf Erik Nordenskiold, interest in shipping across the top of the world waned until climate change made commercial shipping feasible. 00:08:22Global warming and ecotourism are endangering the Arctic's ecosystems and its native Inuit communities such as Shishmaref in Alaska. 00:07:19The Arctic and its many economic possibilities are the focal point of geopolitics led by the United States, Canada, Norway, Russia, Greenland, Denmark, Sweden, Finland, Iceland, China and South Korea.